From niche vintage-inspired designs to comprehensively stocked boutiques offering the most sought-after brands, London really has it all when it comes to gown shopping for your big day. With the right amount of planning, you might find The One in a tiny boutique on Portobello Road or embrace a full sweep (bridesmaid outfits included) at a multi-retailer that won’t leave you shortchanged for the photo booth you just can’t host your nuptials without. It’s a given that you need an appointment everywhere (with smaller brands charging a small amount to deter time-wasters), and weekends are always busy, so if you can devote a midweek day to gown shopping, you’ll find a lot more doors open. You’ll likely be travelling all across town, so make sure your phone is fully charged and make an old-fashioned note of shop addresses and phone numbers in case technology lets you down. Oh, and enjoy! See our recommendations for the best bridal shops in London below. Charlie Brear is a great place to start. It’s hugely popular because of the breadth of choice the made-in-England label offers. There are beautifully made simple dresses for brides who don’t want their gowns to overpower them, as well as brilliant designs that veer on the side of quirky (an off-the-shoulder lacy layer for one, and an openwork paneled top for another). For spirited brides who like the idea of mixing and matching separates, Charlie Brear is your woman. The brand recently relocated to a new flagship in Queen’s Park, and appointments cost £10 for a 45-minute slot. It’s worth signing up for its newsletter to gain access to its sample sales and get engrossed in real-life CB brides courtesy of its weekly wedding story. Open by appointment only from Thursday to Saturday. If you’re after the opposite of a hushed, intimate wedding-dress shopping experience, then take your bridal party to David’s Bridal. Sure, this U.S. import does offer appointments, but its shopping-mall status means it’s like browsing Topshop (if all Topshop offered was wedding gowns). Prices are democratic with styles starting from just £225, and its USP is that it stocks designer diffusion lines such as Truly Zac Posen, White by Vera Wang and Oleg Cassini. Best of all, you can tick off the bridesmaid’s outfits while you’re there. Open every day for browsing. Expect a warm welcome when you head to Halfpenny London’s showroom. Tucked away just moments from the urban buzz of Euston station, here’s a calming boudoir environment decked in vintage-inspired designs infused with designer and founder Kate Halfpenny’s inimitable attention to detail. Yes, there are traditional cuts and options, but it’s the seasonal collections we recommend requesting if you’re after something a little different (rise-and-fall hemlines, pleated-collar bolero tops and pearl-embellished tulle caught our interest online). Midweek appointments are free, and slots rise to £25 at the weekend. For a VIP consultation with the founder herself, expect to pay £50. After the real antique deal as opposed to “vintage-inspired”? Make an appointment with Jane Bourvis. This one of a kind boutique in the heart of boho Portobello specialises in restoring and re-creating wedding dresses from the ’20s and ’30s using vintage silks and embroideries to ensure that every dress is unique. The term “Aladdin’s cave” is justified when referring to Bourvis’s boutique, where the prettiest of gowns are draped from the ceilings, politely begging to be tried on. By appointment only. Open every afternoon from Tuesday to Saturday. 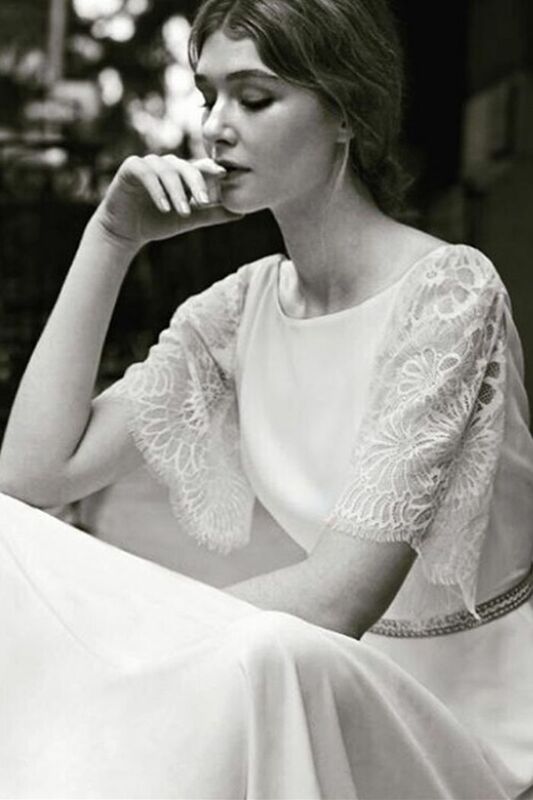 As its name suggests, Belgravia boutique Le Spose di Gio is unapologetically Italian. All of the label’s dresses are made in Milan using locally sourced fabrics, so brilliant craftsmanship is a given. London is home to the brand’s only wedding boutique outside of Italy (where it has five established boutiques), and it’s a destination for the most elegant yet light fairytale gowns. Appointments cost £30, but are free on Wednesdays and Thursdays. Browns is renowned for its edit of the most exciting designer labels, and its bridal outpost has become a byword for upmarket Mayfair elegance. It dubs itself London’s most exclusive bridal boutique, and it’s certainly up there: Expect plush surroundings and to-die-for gowns from world-famous brands such as Marchesa and Viktor & Rolf. The boutique also stocks lesser-known names revered in the bridal world, such as Galia Lahav and Mira Zwillinger. Appointments cost £30 for a one-hour slot but are redeemable with a purchase. Show us how you shop for your wedding attire—DM us on Instagram.